The Severn at Shrewsbury frae Shrewsbury Castle. The River Severn (Welsh: Afon Hafren, Laitin: Sabrina) is the langest river in the Unitit Kinrick, at aboot 220 miles (354 km). It rises at an altitude o 2,001 feet (610 m) on Plynlimon, close tae the Ceredigion/Powys border near Llanidloes, in the Cambrian Moontains o mid Wales. It then flows throu Shropshire, Worcestershire an Gloucestershire, wi the coonty touns o Shrewsbury, Worcester an Gloucester on its banks. Wi an average dischairge o 107 m3/s (3,800 cu ft/s) at Apperley, Gloucestershire, the Severn is the greatest river in terms o watter flow in Ingland an Wales. ↑ "National River Flow Archive – 54001 Severn @ Bewdley". Retrieved 24 January 2008. ↑ "HiFlows-UK". Archived frae the oreeginal on 9 January 2007. Retrieved 24 January 2008. ↑ "Frankwell Flood Alleviation Scheme, Shrewsbury" (PDF). UK Environment Agency. Retrieved 13 March 2010. 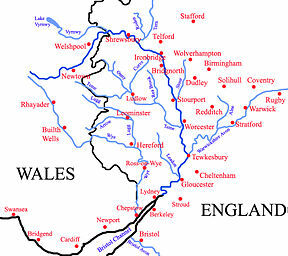 ↑ "The River Severn Facts". BBC. Retrieved 28 December 2006.